Pet Fit For Lifcuste has been around for 6 years creating quality cat and dog accessories for our customers. We offer our products via Amazon.com, Chewy.com, Walmart.com and our own website at www.petfitforlife.com. We offer world class customer service. 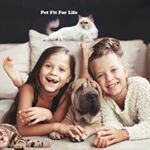 Check out or product in our Amazon store at www.amazon.com/petfitforlife.